WORSE EXPERIENCE EVER! YOU DO NOT KAYAK IN THE OCEAN....VERY UNSAFE AND THE INSTRUCTOR WAS NOT HELPFUL AT ALL...WOULD NOT RECOMMEND AT ALL. MY DAUGHTER AND I DID NOT FEEL SAFE. Thus tour was amazing! We got to see a bunch of dolphins and our guides were really cool. HIGHLY RECOMMEND THIS TOUR! My wife and I really enjoyed our morning out on the water. We saw plenty of Dolphin. 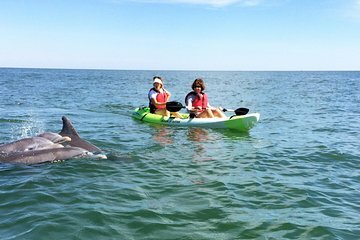 The guides were knowledgeable about some VA Beach history and about the various Dolphin and their habits. Icing on the cake for us was being able to catch a wave on the return bark in. Such an awesome experience! Our guide was fantastic! We saw so many dolphins. Would do this again in a heartbeat!! This was an awesome trip! It is my understanding from talking to our guide that they don't see many dolphins when they go out, but we were able to see a lot of them. I've never been kayaking and was a little concerned that it would he difficult and tiring, but it was actually very easy and relaxing. It was a lot of fun and worth it. The guide was fantastic and made the trip even more enjoyable!! She was knowledgeable, welcoming, and patient. We had a great time and would definitely do this trip again! Had a 9:30am tour and it was great! Frazier was the tour guide we had and he was wonderful, explained as much as he could and gave us ton of information about the dolphins and the location itself. You literally see dolphins right in front of you, definitely worth the time and money!